My name is Rhianne Holvey and I am the owner of Beauty in Wonderland. I’m a qualified beauty therapist, hairdresser and barber……I am also a qualified exercise to music instructor and have taught Zumba classes for nearly 8 years. From a young age it was quite obvious that this would be my career when I began to cut my dolls hair and doing their make-up, whilst also having a go cutting my own hair at the age of 4. From this I moved on to begin my formal training at college but during this period I used family and friends for my practice. I have worked within the industry managing a Beauty salon in Cardiff , working as senior therapist at The Celtic Manor resort and Spa and working for Paul Mitchell as a product specialist. Following this I began my own business as a mobile beauty therapist (Mobile Beauty by Rhianne) offering all types of beauty and hair treatments whilst building up a good portfolio by doing make-up and hair for weddings. During this time I also built up a strong clientele, gained lots of experience and trained in many new treatments within the industry. April 2015, was when I opened Beauty by Rhianne located at a hair salon in Newport, this then made me realise how big my passion was to own my very own salon. May 2016 saw the doors open to Beauty in Wonderland right here on Caerleon Road, its where I grew up and is a well-known and busy part of Newport. 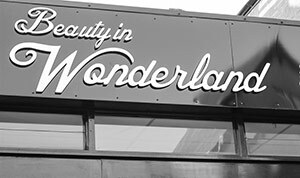 We offer a wide range of beauty services including Make-up, spray tans, shellac and lashes and we have recently launched ‘The Blow Dry Bar @ Beauty in Wonderland’ where we will offer beautiful bouncy blow dry’s and hair styling.